American manned spacecraft. Study 2012. The Crew Exploration Vehicle first proposed by Lockheed was a lifting body with a total mass of 18 metric tons and a crew of four. AKA: Crew Exploration Vehicle. Status: Study 2012. Gross mass: 20,000 kg (44,000 lb). Height: 11.00 m (36.00 ft). Diameter: 3.50 m (11.40 ft). This design was rejected by NASA, and the final concept was a steep-sloped ballistic capsule. Lockheed's preferred CEV design consisted of three modules - a service module, crew module, and mission module. The favored crew module on which the most design work was dedicated was a lifting-reentry vehicle. However in the final design a steep-sloped ballistic capsule crew module was included at NASA's insistence. For missions to lunar orbit the lifting-body crew module would dock in orbit with the other two modules to create a 21.3 m long combined vehicle with a total mass of 39 metric tons. The crew module's redundant thermal protection system consisted of a primary reusable carbon-carbon SLA-516 heat shield over a back-up ablative layer. The ablative layer covered a titanium heat-resistant vehicle structure. This combination would still protect the crew in case of a failure of the primary shield during re-entry. Although winged, the crew module would use parachutes or airbags for landing. In case of an emergency during ascent or descent from orbit, the forward 6.7 m of the spacecraft formed a separable rescue module. The crew module would be oriented by a gaseous nitrous oxide monopropellant reaction control system, with primary propulsion being via low-thrust liquid oxygen/ethanol bipropellant engines. 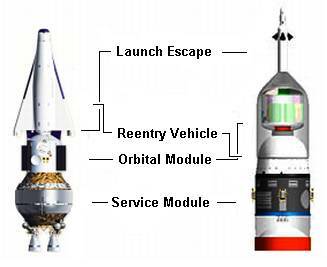 The final ballistic CEV design was very Soyuz-like in appearance. For the lunar landing mission, Lockheed proposed a minimum delta-V approach, restricting manned moon exploration to equatorial sites for missions of 30 to 630 days duration. Lockheed also argued that equatorial sites minimized entry/descent/landing problems on return from the moon; was the most energy and mass efficient location; allowed an incremental build-up of lunar surface infrastructure; had the most favorable thermal environment (20 deg C to -140 deg C); and was the safest approach from a crew safety point of view. 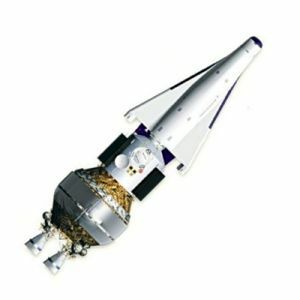 Two launches by a 70-metric ton-payload heavy-lift vehicle would put the elements of the lunar spacecraft into low earth orbit. 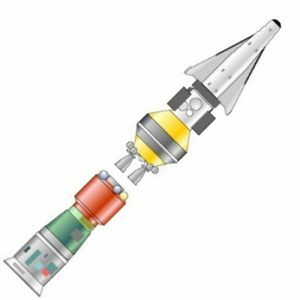 The first unmanned launch would put the CEV's Mission Module, the LSAM lunar lander, lunar surface cargo and the trans-lunar injection TS1 stage into orbit. The second launch would put the CEV together with the larger TS2 propulsion stage into orbit. The CEV would rendezvous and dock with the LSAM stack. The TS1 stage would fire, making 40% of the delta-V required for trans-lunar injection, then be cast off. The stack would rotate 180 degrees, and the TS2 stage would fire, completing the TLI burn and sending the stack towards the moon. At the moon, the TS2 stage would fire again, putting the stack into lunar orbit. The crew would enter the Mission Module docked with the LSAM and descend to the surface. Following exploration, they would return to lunar orbit, dock with the CEV, and cast off the LSAM. The TS2 stage would fire a third time, sending the CEV back towards earth. Unlike the NASA concept, the CEV would have no TEI propulsive capability itself. Naturally, Lockheed found that the ideal launch vehicle would be a derivative of its Atlas V ELV. They proposed an Atlas V Phase 2 booster using three parallel 5-m-diameter wide-body Common Core Boosters with cross-feed between the stages. The design would be human rated and used for both crew and cargo launches. Lockheed found that this design met NASA's current human-rating requirements (e.g., 100% engine out, 100% abort to orbit); had the lowest long-term cost; was derived from an existing ELV with an outstanding reliability record; and would be a part of an evolutionary family of smaller vehicles for wide variety of performance and applications. By comparison, Lockheed found that using NASA's Shuttle-derived Single Rocket Booster (SRB) for the crew would have both high nonrecurring and recurring costs; and be a single-customer, single-application (launching crew) dead-end design with no future applications. Lockheed's study started with the requirements for the eventual Mars mission and worked backwards from that, with numerous trade studies conducted. The first lunar landings would be just demonstration stunts to meet NASA's goals. The follow-on missions would be long-duration engineering testbed missions to prove equipment for future Mars expeditions. Family: Lunar Bases, Manned spacecraft, Moon. Country: USA. Agency: NASA, Lockheed. Comparison of Lockheed and Northrop CEV proposals.